Steven (Chicagoland, United States) on 6 December 2017 in Animal & Insect and Portfolio. A Malabar Tree Nymph butterfly spotted at the Niagara Parks Butterfly Conservatory in Niagara Falls, Ontario, Canada. The Niagara Parks Butterfly Conservatory is a butterfly house operated by the Niagara Parks Commission in Niagara Falls, Ontario, Canada. It is located approximately 5.6 miles north of Niagara Falls on the grounds of the Niagara Parks School of Horticulture, which is 99 acres in size. The conservatory was opened in December 1996 with a gift shop, 200-seat theater/auditorium room, and a climate-controlled greenhouse. The conservatory has over 2,000 tropical butterflies from over 60 different species. The conservatory glass dome is 11,000 square feet in size with 590 feet of paths inside the greenhouse portion, which has a wide variety of foliage. Since captive butterflies usually have a lifespan of 2–4 weeks, the conservatory imports up to 3,000 butterflies per month from world butterfly farms in Costa Rica, El Salvador, the Philippines, and Australia. Beautiful Butterfly here....We saw many when we lived in PA but not too many here in WA - Beautiful image, sir! Aha! So THAT'S what it's called. We also saw these at the Butterfly Center at Callaway Gardens in Pine Mountain, GA, Steven. I think they were my favorites of all the ones I saw. @Ginnie: It took me along time to find out its name, too. :-) Glad that someone benefitted! What a perfect study here. Superbe photo de ce beau papillon. This beautiful creature makes a precarious perch look effortless and elegant. Excellent image. Une très belle macro ! Quelle macro et papillon quel rendu sur les ailes grandiose vue. 5 stars from me. This is spectacular! Great capture !!!! Wonderful imge ! 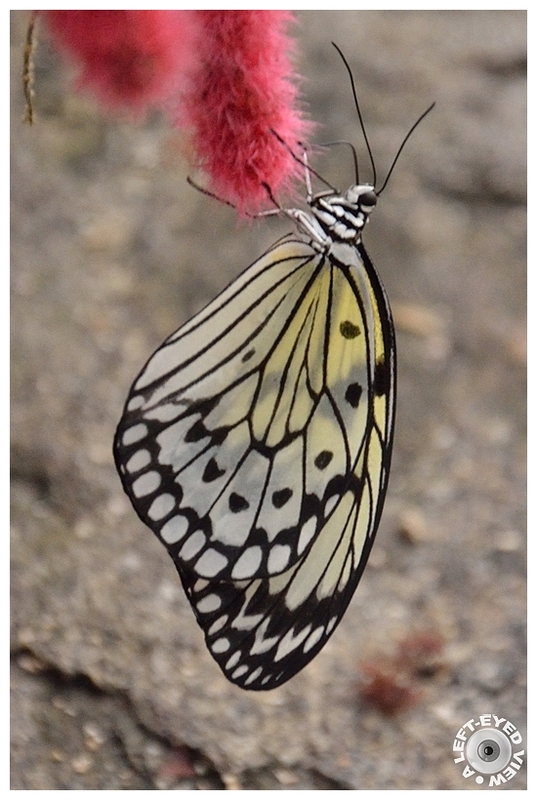 LOve these butterfly images...which are tough to capture ! A marveloous capture of this great looking butterfly. A gorgeous image of this beautiful insect. Wow, this must be an amazing place! We have a little butterfly exhibit every summer near where I live but there might be 200 butterflies. I cannot imagine 2,000! I could probably spend hours there! This butterfly is just gorgeous. I love the pattern and color! The butterfly with its beautiful wings! Spectacular! lovely composition and excellent sharpness. The "hanging" posture adds tension to the shot.